What do when you just announced your bid for president of the United States? If you are Senator Kamala Harris, you got to an HBCU hoops showdown. The California senator and Howard University alumnus pulled up to her alma mater on Monday afternoon as it faced off against Harvard in Burr Gymnasium. Sen. Harris announced her run for the White House Monday morning, which happened to be Martin Luther King Jr. Day. She followed it up by returning to her alma mater shortly after her bid to speak to the media before hitting up the game, which Howard lost 84-71. 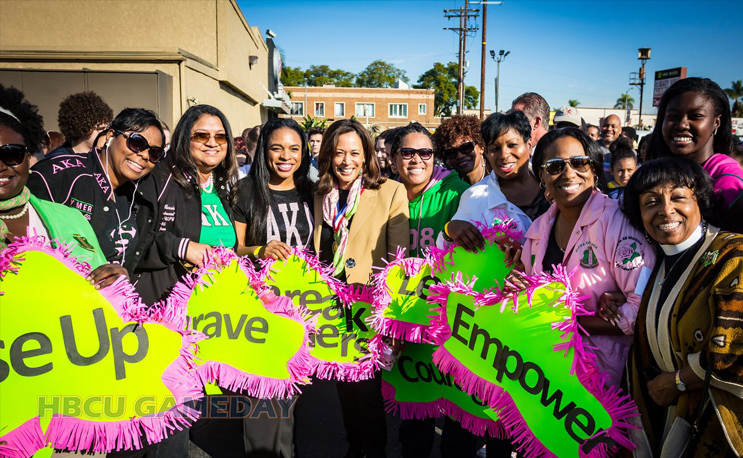 It’s fitting that Sen. Harris returned to HU as that its the place where here political journey began. She was elected reshman representative to a student council for liberal arts majors. . She majored in political science and economics later crossed Alpha Kappa Alpha’s at HU’s Alpha Chapter. She later became an attorney, a two-time attorney general in California and in 2017, a US Senator. Harris’ campaign is historic for obvious reasons. The child of Indian mother and Jamaican father, she would be the first-ever woman elected President if she won the nomination. And she would be the second person of African descent to assume the position, following behind the 45th President of the United States, Barak Obama.